There are more Traviata posters to be won! Last night's performance saw a very full house and a host of funny captions to boot. 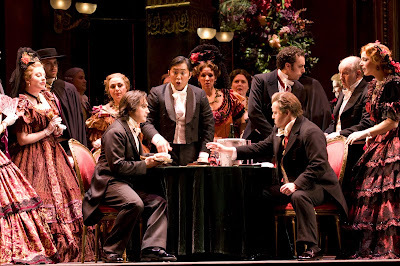 Today's winner is Sean Moore for his caption, "Lavish costumes still predominate in Sir Mix-A-Lot's otherwise thoroughly modern interpretation of "La Traviata." In this still, Violetta (Eglise Gutiérrez) plays coy as Alfredo (Francesco Demuro) sings, "LA face with the Oakland booty," from the "Un dì, felice, eterea" remix." With only three performances of La Traviata remaining after today, here is the latest daily photograph for more entertaining caption writing. "So it's agreed - if the chubby guy can swallow the shish kebob you win the pot." Comment: I saw the production Friday. I must say that Francesco Demuro has one of the most beautiful tenor voices I have heard in a very long time. Oh no! The girls are moving in to play now. We have to fend them off! I guess you have not been listening to many Tenors nowadays.He is OK but not that impressive. His voice is so raw for this role that he cracks and have difficulty in some parts. He use FALSETTO to hit the C he wobbles in the middle range at 29! !I dont how long his voice will last. I guess you have not been listening to many Tenors nowadays.He is OK but not that impressive. His voice is so raw for this role that he cracks and have difficulty in some parts. He use FALSETTO to hit the C he wobbles in the middle range at 29! !I dont how long his voice will last.I think the Asian guy sounds more of an Alfredo than a Gastone.He should be Alfredo and Demuro as Gastone.He even drowned him in most of his scene with Demuro. OMG! I thank you Adrian for having the courage to share your thoughts! I have been listening to this guy since Hoffmann and I think you are right!!Mr. del Rosario sounds more of an Alfredo than a Gastone and his voice sounded better than Mr Demuro.I am hoping that Mr. Jenkins will open his ears and give this guy a chance to sing a principal role someday.He will even save more money for this guy is local, he does not need to go to Europe to get a tenor all he has to do is look into his own backyard.Cheers!! !